Ninotchka with Greta Garbo and Melvyn Douglas (top). 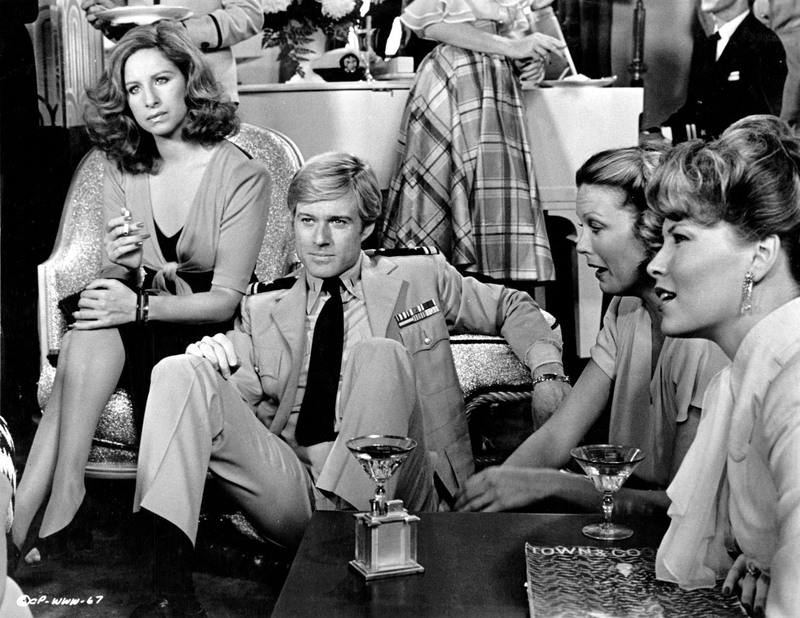 The Way We Were with Barbra Streisand and Robert Redford (bottom). From the Romanovs' last stand to Warren Beatty's first solo directorial effort: On every Wednesday in January 2010, Turner Classic Movies will present the 20-film festival “Shadows of Russia,” a showcase of Hollywood movies portraying Russia (and/or the Soviet Union) and the sociopolitical reverberations of Communism throughout the 20th century. Among the scheduled films are classics such as Ninotchka, The Manchurian Candidate, and Reds, in addition to lesser-known fare like Counter-Attack, I Was a Communist for the FBI, and The Strawberry Statement. Get ready for some laughs and a few tears – mostly laughs. And mostly of the unintended kind. I must red-facedly (no pun intended) admit that I've never seen Mission to Moscow, the 1942 pro-Soviet melodrama that got Warner Bros. in trouble when – within a matter of a few years – Russia, the anti-Nazi Savior, became Russia, the Satanic Empire. Something tells me that Mission to Moscow will either be very funny or very dull. It all depends on how star Walter Huston (as a US ambassador), director Michael Curtiz, and screenwriter Howard Koch handle the melodrama's Praise Ally intentions. But hey, whether good or bad, Mission to Moscow is a must-see, and not only for historical reasons. After all, this $2 million production co-stars the unjustly forgotten Ann Harding, one of the most striking performers of the '30s and '40s. As a plus, the gorgeous and talented Eleanor Parker has a supporting role in it. The hysterically funny Ninotchka (1939), one of Ernst Lubitsch's most delightful comedies. Greta Garbo plays a Red ideologue who discovers laughter, femininity, Parisian lights, and Melvyn Douglas while trying to retrieve a trio of ex-Commies lured by the joys of the Capitalist World. Comrade X, released the following year, is a pale imitation – but still watchable. Hedy Lamarr is the Red; Clark Gable the Ham. Directed by right-winger Leo McCarey, the (unintentionally) hysterically funny My Son John (1952), a TCM premiere, features Robert Walker – who deserved much better – as an All-American Red (you can't trust anyone, can you?) who dares to swear on the Bible his own mother gives him. The catch is that Commies are atheists, see? They can touch any holy book and still lie. Worse yet, they have no respect for their mommies. (Helen Hayes plays the Suffering Mother in this one.) Since Walker died during production, the ending used in My Son John was borrowed from Strangers on a Train. The screenplay was co-written by McCarey, and fellow right-wing nuts John Lee Mahin and Myles Connolly. Sydney Pollack's The Way We Were (1973), a romantic melodrama that was much criticized for its superficial portrayal of the anti-Red hysteria of the late '40s and '50s. Should I recommend it? Well, The Way We Were is the kind of movie that will make some cry, some laugh, some groan, and some do all three at the same time. From what I remember, I did more groaning than anything else, but the film does have its moments. Barbra Streisand and Robert Redford co-star. Veteran Viveca Lindfors has a memorable supporting role. Two other TCM premieres in the “Shadows of Russia” series are The North Star (1943), another pro-Soviet World War II drama that got its makers in trouble (this one was directed by Lewis Milestone and written by Lillian Hellman), and I Was a Communist for the FBI (1951), a spy thriller directed by the reliable Gordon Douglas and written by former silent film actor Crane Wilbur. Frank Lovejoy stars. Curiously missing from the “Shadows of Russia” series: Nicholas and Alexandra, Franklin J. Schaffner's sumptuous (but dull) 1971 historical melodrama depicting the last days of the Russian Imperial Family, and David Helpern's 1976 Oscar-nominated documentary Hollywood on Trial – not to mention The Front, released that same year – both of which deal with the post-war anti-Red hysteria in Washington/Hollywood. According to the TCM press release, “Shadows of Russia” was conceived by New York Post critic Lou Lumenick and film blogger Farran Smith Nehme, who brought the idea to TCM after writing about the February 2009 showing of Mission to Moscow. And finally, each “Shadows of Russia” evening will focus on two themes: Twilight of the Tsars and Red Romance on Jan. 6; The Lighter Side of the Revolution and The Left on Campus on Jan. 13; Our Red Army Pals and Diplomatic Immunity on Jan. 20; Spies Among Us and The Height of the Cold War on Jan. 27. 8 p.m. The Scarlet Empress (1934) - starring Marlene Dietrich and John Lodge. 10 p.m. Rasputin and the Empress (1932) - starring John, Ethel and Lionel Barrymore. 12:15 a.m. Red Danube (1949) - starring Walter Pidgeon and Ethel Barrymore. 2:30 a.m. Reds (1981) - starring Warren Beatty, Diane Keaton, Jack Nicholson and Maureen Stapleton. 8 p.m. Comrade X (1940) - starring Clark Gable and Hedy Lamarr. 10 p.m. Ninotchka (1939) - starring Greta Garbo and Melvyn Douglas. Midnight The Way We Were (1973) - starring Barbra Streisand and Robert Redford. 2:15 a.m. Spring Madness (1938) - starring Maureen O'Sullivan, Lew Ayres, Ruth Hussey and Burgess Meredith. 3:30 a.m. The Strawberry Statement (1970) - starring Bruce Davison, Kim Darby and Bob Balaban. 8 p.m. The North Star (1943) - starring Anne Baxter, Dana Andrews and Walter Huston. 12:15 a.m. The Kremlin Letter (1970) - starring Bibi Andersson, Richard Boone, Max von Sydow and Orson Welles. 2:15 a.m. Conspirator (1949) - starring Robert Taylor and Elizabeth Taylor. 4 a.m. Counter-Attack (1945) - starring Paul Muni and Marguerite Chapman. 8 p.m. My Son John (1952) - starring Helen Hayes, Robert Walker and Dean Jagger. 10:15 p.m. I Was a Communist for the FBI (1951) - starring Frank Lovejoy and Dorothy Hart. Midnight The Manchurian Candidate (1962) - starring Frank Sinatra, Laurence Harvey and Angela Lansbury. 2:15 a.m. The Bedford Incident (1965) - starring Richard Widmark and Sidney Poitier. 4:15 a.m. Scarlet Dawn (1932) - starring Douglas Fairbanks Jr. and Nancy Carroll. 5:15 a.m. The Doughgirls (1944) - starring Jane Wyman, Ann Sheridan, Alexis Smith and Eve Arden. This is fantastic! I didn't know about it! Your site is so informative.